The Bronx, NY USA. Stephen Ritz is a South Bronx educator and innovator who believes that students shouldn’t have to leave their community to live, learn, and earn in a better one. Moving generations of students into spheres of personal and academic successes which they had never imagined — while reclaiming and rebuilding the Bronx — Stephen’s extended student and community family have grown more than 50,000 pounds of vegetables in the Bronx while generating extraordinary academic performance. Stephen was named a Top 10 Finalist for the prestigious $1 million Global Teacher Prize in 2015. Stephen helped earn his school the ﬁrst ever Citywide Award of Excellence from the NYC Strategic Alliance for Health and directly attributes these results to growing vegetables in school. To reclaim his own health and model good behavior for his students, he lost 100 pounds by eating what he and his students grow. In 2013 The United States Department of State and New York Foreign Press Corps toured representatives from 40 countries across Stephen’s worksites and classrooms. He was selected as a delegate at WISE (World Innovation Summit for Education) and as a national Green Apple Education Ambassador for the Center for Green Schools at the US Green Building Council. In 2014, Green Bronx Machine celebrated a Best of Green Schools Award — one of only ten recipients across the United States, and The National Association of Secondary School Principals cited Stephen’s work and Green Bronx Machine (www.greenbronxmachine.org) as one of ﬁve national exemplars of service learning. Aﬀectionately known as “America’s Favorite Teacher,” Stephen has moved attendance from 40% to 93% daily, helped provide 2,200 youth jobs in the Bronx and captured the United States EPA Award for transforming mindsets and landscapes in NYC. A strong advocate for Project Based Learning, Stephen is an annual presenter for the Buck Institute and works with school districts and universities across the country. Stephen has worked with and conducted professional development for the AFT, UFT as well as charter, independent, public and private schools. American Teacher: Heroes in the Classroom identiﬁed and featured Stephen as one of the top ﬁfty teachers in America. Stephen has electriﬁed and inspired audiences of all types with his “Si Se Puede” message of hope, urgency, resilience and Amer-I-Can innovation. His impassioned speeches have resulted in raucous standing ovations from audiences around the world — including the United Nations Social Innovation Summit, the Green Schools National Conference, Innovation Land, American Institute of Architects and the World Business Forum. He even delivered a keynote address at the Clinton Global Initiative on Earth Day. He has also worked with and consulted for various Fortune 100 / 500 companies. Stephen uses his platform of public speaking to support numerous philanthropic activities locally, nationally and abroad. 2016 was Stephen’s biggest year to date. On top of his frequent speaking events (some of which included audiences topping 10,000 attendees) and daily school responsibilities, he worked to develop a ground breaking, internationally certiﬁed curriculum which embeds concepts of sustainability, food, energy and environmental justice aligned to STEM content areas for elementary schools. Stephen and the Green Bronx Machine also brought to life the ﬁrst ever independently ﬁnanced National Health, Wellness and Learning Center in a 100+ year old reclaimed school library in the South Bronx at Community School 55. 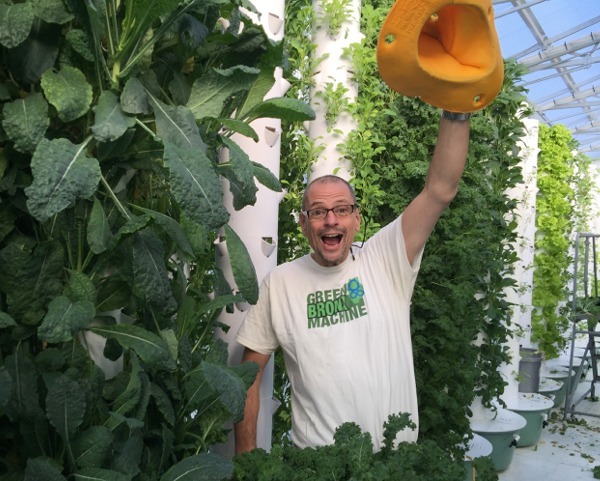 Soon thereafter, he partnered with LoyaltyOne in Canada to launch “The Good Food Machine” in 10 elementary schools, modeled after his programs in New York. The U.S. Botanic Garden in Washington, D.C. erected a model of his classroom as an example of successful urban agricultural integration into academia. He presented twice at The White House — once for the “State of STEM” event and again for the ﬁrst annual South by South Lawn event. Stephen also signed a book deal with lauded health publisher, Rodale. 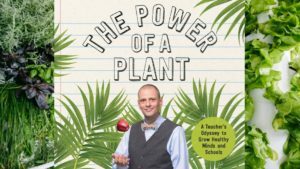 Aptly titled, The Power of a Plant, the book is due to hit shelves in May of 2017. Order The Power of a Plant and see Stephen’s entire bio here.